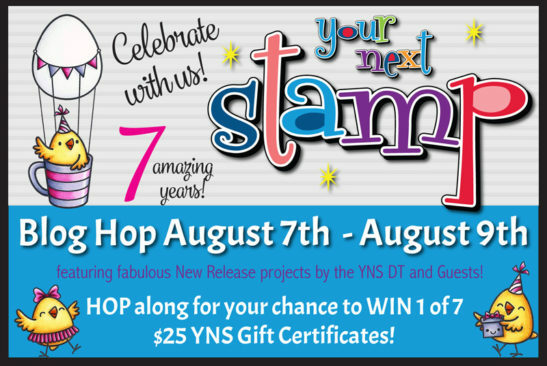 Whoo Hooo... it's time for the Your Next Stamp August Release and this month it's a special one because YNS is turning 7!! Hop along with us as we celebrate with projects from the Design Team and some Special Guest! We also have some fun Prizes and a special in the Store! My first project uses the new Tweet News set and coordinating die. I also used some of the Fabulous new patter paper from the Swirly Fun pack. Yep... Pattern Paper from YNS, how awesome is that? I die cut two pieces of the pattern papers with the Stitched Rectangle Die set and then I created a frame from some White card stock using the Stitched Rectangles as well. I used some Woodgrain paper to create my card base and I adhered the papers and the frame using some foam adhesive. I stamped the bird image onto some Copic friendly card stock and colored them in then I used the coordinating dies to cute them out. I added some Clear Wink of Stella to the birds and adhered them with some more foam tape. I added some of the Spellbound Gumdrops as well. I die cut the Cool Tag Three Banner and stamped the sentiment in VersaMark ink and heat embossed it in White. Then I added it to the upper corner of the frame. 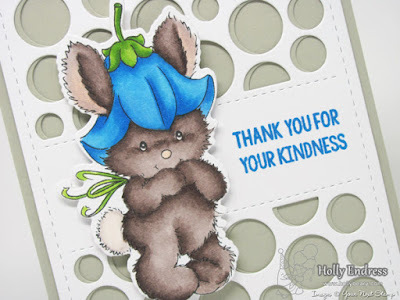 My second project uses Bluebell Bunny and the new Circle Panel Die. I created a Sand card base and I die cut the Circle Panel from an additional piece of Sand and White. Then Offsetting them to create a shadow I adhered the White panel over the Sand one. Then I stamped the sentiment using some Blue ink onto the White panel. I adhered the panel to the Sand card base. I stamped the Bluebell Bunny image onto some White card stock and colored it in with Copics and then I added some Clear Wink of Stella to the flower. I die cut the image using the coordinating die and adhered it to the card front with some foam tape. I used the E70 markers to color the Bunny in. Be sure to head over to the store after you are done Hopping so you can pick up this Fabulous Release and Leave comments along the way for a chance to win a $25 Gift Certificate to the Store.. There are 7 of them up for grabs this month!!! See I told ya we were having a PARTY!!! Are you ready to get Hopping? Don't forget to comment along the way for a chance to WIN... Happy Hopping! I just love the blues you used on your cards! I really like those birdies in a row. They are such happy little chicks! And that sweet bunny too. Love the way you colored it! Love your cards. The birds are so cute. Love both your cards. That paper pattern is really nice now that I can actually see the whole piece. And I love how you colored the bunny. Blue is my favorite color. LOVE your color scheme and wonky panels on that tweet birdie card :o). The Bunny looks so awesome over the circle panel. Wonderful inspiration - Thanks!!! SQUEE love your creations Holly. I love that coordinating die with the birdies. Both of your creations are sooooo adorable! Love the new release! Both are adorable, but I just love the bunny!!! Awww Holly, your cards are totally awesome! I love that sweet bunny and how you coloured him! Amazing job! Such cute cards! I love your coloring of the birds and bunny. Both cards are adorable. I love the circle panel die and how you put that adorable bunny on. Lovely cards! That circle panel die is too nice to pass up! The birds are super cute and I really like your fun layering. Sweet cards! I really love the purple and blue combo for the bird card! Oh goodness! Look at that bunny! I love your coloring!! Way too cute!! I love those little birds! Your bunny is adorable!! Beautiful! Love how you did your cards! The way you placed your papers on the card with the birds on the line is so nice, and the bunny on that die cut background is perfect!! Your cards are adorable! Love these new stamps and dies!! Great cards! I love the wood grain paper behind the birdies and shadow behind the Circle panel is a great detail! Sweet cards! Love the adorable row of birds! The Circle Panel die is a favorite too! Absolutely adorable!! The birdies are just precious! I am sooooo in love with that bunny!! She will make such a fun addition to any kind of card!! What wonderful cards! I love the gorgeous shade of blue you used on both. The new paper pack looks like it's filled with beautiful colors and patterns. Both of your cards are beautifully designed! 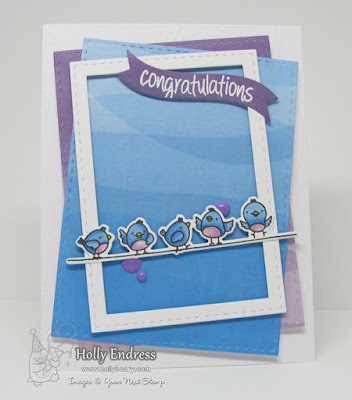 Hi Holly ~ Your cards are fantastic!! Those birdies in front of the new patterned paper are absolutely adorable!! That paper pack is on my MUST have list. Love it. The moment I saw that circle die I knew it was made for me and I actually NEED TO HAVE IT!!! I have to say that you've colored that darling bunny to perfection! Thanks so much for sharing. Enjoying your cards! Love the off-set of your layers on the bird card and so happy to see a "birds-on-a-wire" card that is both cute and has a die to cut it out. Also love the coloring on your bunny. Thanks for the inspiration. Very cute cards. I'm a birdie lover so you know I have to get Tweet News. That circle panel die is caaaaaaaaaute! Adorable cards. Both cards are beautiful, but I love that circle panel die background! Gorgeous! 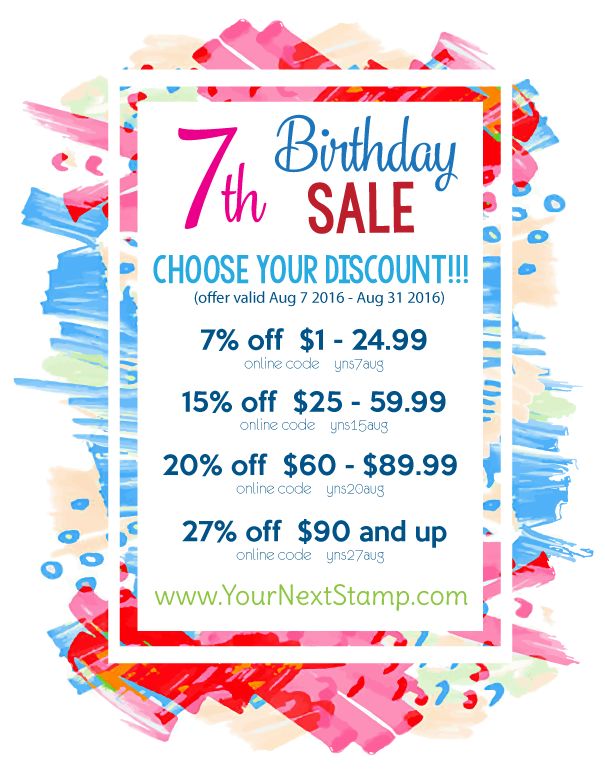 Happy 7th birthday to Your Next Stamp. Lovely cards. My fav is the birds stamp. 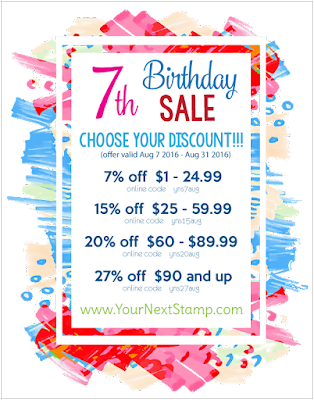 Love the look of your card. Love the dot die and like how you off set the two. Great work. Very cute card designs--I like your coloring. Both cards is so cute, congratulations on your 7th celebration . 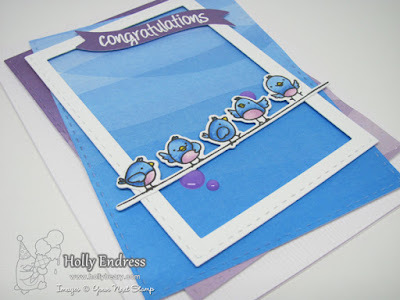 What cool layers on your bird card and I LOVE how you colored that adorable bunny! Two really charming cards, Holly! Thanks so much for inspiring us! I love both of your cards! I like the offset frame and layers on the first one - and the swirl paper! Love the circle panel and bluebell bunny on the second card! Lovely colouring - he looks so precious! This is a great release! Love all of your fun, multi-layered backgrounds. How fun. Love both of your cards. Two outstanding cards. I love both of them. Cute card . Love your bunny colouring.